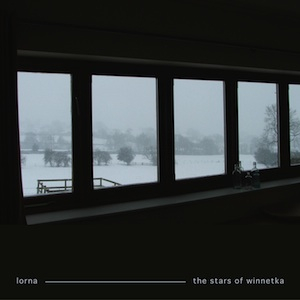 The Stars of Winnetka is the fifth album by the Nottingham sextet Lorna – a digital-only collection of nine original and traditional holiday- and winter-themed compositions. A perfect companion for the winter months, The Stars of Winnetka features the trademark vocal harmonies of husband and wife members Mark Rolfe and Sharon Cohen-Rolfe and skilled musical arrangements that intricately weave together a wide array of woodwinds, strings, keys, and percussion. The record appropriately begins with "The First Person to Arrive" – a Lorna original centered around a Dickensian winter’s story enmeshed in gorgeous melodies befitting the best of Belle and Sebastian. "Hannukah," another original that includes a guest appearance by Should's Marc Ostermeier on guitar, was born during an electronic music project of the Rolfe's in 2001, but is reimagined here in Lorna's unmistakable style with gorgeous guitar and string melodies. "Kuskova," a b-side from the "As She Goes By" single, was written by flutist Matt Harrison and is an upbeat flirtation with the band's dream pop/shoegaze roots with blurred, languid vocals by Rolfe and Cohen-Rolfe channeling Slowdive's Neil Halstead and Rachel Goswell. The Stars of Winnetka finds also Lorna reinterpreting a handful of well-known and obscure traditional holiday songs including "Little Donkey" (a children’s song in the United Kingdom), "Shalom Chaverim" (a Hebrew hymn which translates to "Peace to Friends"), and "Lo, How a Rose E'er Blooming" (a 16th century carol). "Building Beautiful Buildings (The Excited Reindeer Mix)" is one of two selections culled from the band's first two albums that Lorna reworks to dramatic effect on the new record. "Buildings" was originally recorded as a bass-driven slowcore dirge on 2004's This Time, Each Year but is transformed on Stars of Winnetka as a lush, mid-tempo number galloping along by a metronome of bells and keys and production with a nod to Phil Spector. "Snowsong," from 2005's Static Patterns and Souvenirs, takes the opposite approach, stripping down cult graphic artist Aaron Jasinski's song into a poignant, piano-and-strings arrangement with Cohen-Rolfe taking over lead vocals from Rolfe in this new recording. Rolfe wrote "Snowlights" with the idea of exploring the creative headspace of friend and labelmate Jason Gough of Coastal (who appears on Lorna's fourth record, Heart of Wire). It also marks the first Lorna recording to feature the band's two new members: violist Rein Ove Sikeveland and drummer Andrew McNamara. "Lo, How a Rose E'er Blooming" closes the record with the band splitting the original soprano-alto-tenor-bass choir arrangement into four instruments: bass, viola, clarinet, and flute. The vocals are delivered with Cohen-Rolfe doubling on alto and soprano, Rolfe on tenor, and Andy Bullock on bass.